I have a new colleague whom is a young chap and someone who simply lives to eat. And because he’s just so full of ideas for food, every time when I am in a dilemma on what to eat, he can provide me with all sorts of suggestions. 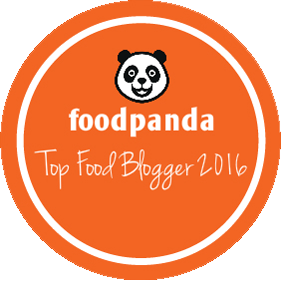 YES, even as a food blogger, I have my dilemma for food at times, in fact most of the times !! 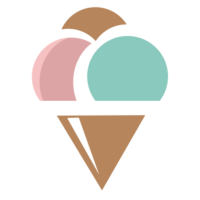 I think it’s precisely that as a food blogger, I always have 1001 ideas on what to cook or bake or what I wanna do, but I never really get down to doing it eventually coz I can’t make up my mind which one I should choose ?? So at the end of the day, I get so tired thinking that I would simply nua and NOT do anything at all ! LOL !! Ironic, isn’t it ? So that day this new colleague of mine was suggesting a 一品锅. Can’t exactly remember what the conversation was about though, but the name of the dish rang a bell within me. Instead of a huge project like those 盆菜 that we had during CNY, I can always make do with a mini one with everyday ingredients. Plus the chilled weather for the entire day, the mood was just more than fantastic. 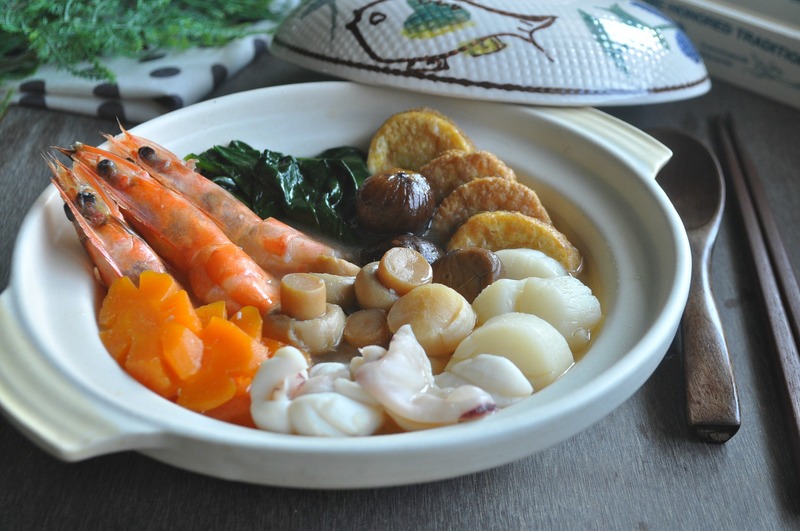 So what’s better than a pot of warm and inviting Seafood Superior Pot to end the day with ? 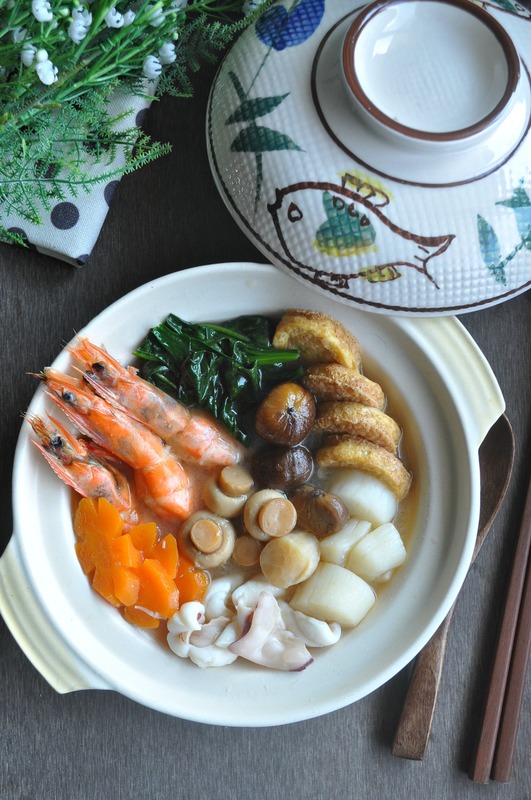 The sweetness from the fresh seafood being cooked in a flavourful broth that’s fused with some abalone and oyster sauce and made complete with some green as spinach, made this a real delightful one pot dish ! Although the dish is termed as superior pot (一品锅), it doesn’t necessary mean that it has to be served in a very elaborate manner. To make it as homely as possible without losing the original intent, I used daily food ingredients that are easily available too so that you can tuck into this dish anytime even when it’s not a festive period ! 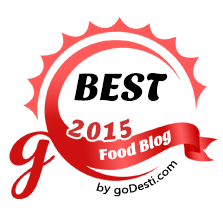 Remember to get your everyday fresh groceries from PurelyFresh online for all your cooking needs !! Heat up 1 tbsp of cooking oil and saute the minced garlic till fragrant. Add in the dried scallops together with the water that is used to soak the scallops and the chicken stock. Add in the abalone sauce, oyster sauce, sugar, hua diao wine and sesame oil accordingly. Stir well and allow the broth to simmer further till it boils. Add in the carrots, chestnuts (if using) and mushrooms. 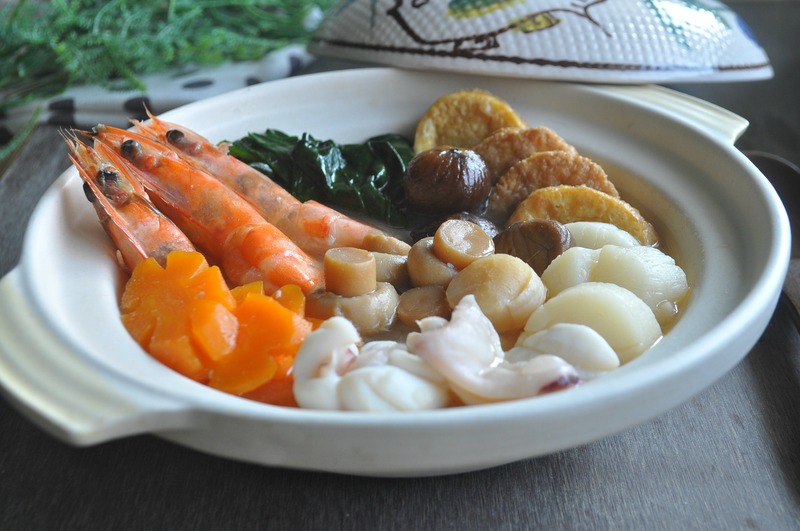 When the carrots has softened, add in fresh scallops and squids, tofu and lastly the prawns. When the prawns has start to turn reddish, add in the thickening solution. At the same time, heat up a clay pot or any other pot that you intend to serve the dish in. When the broth has thickened, off the heat immediately. 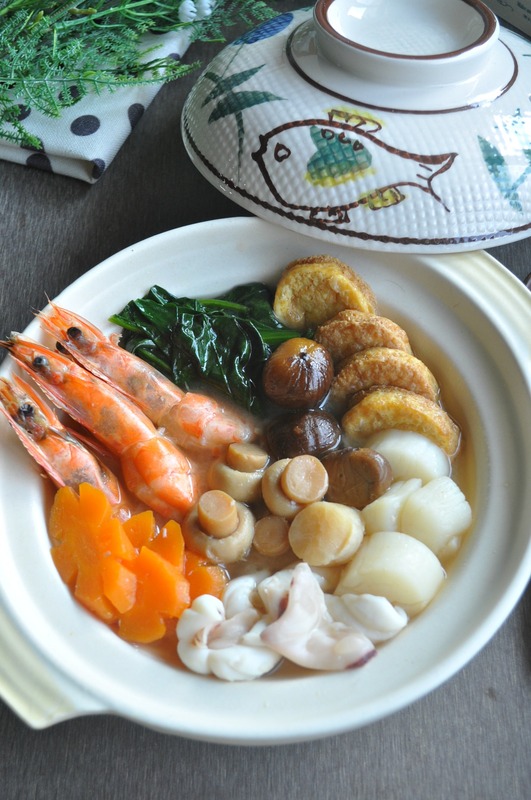 Place the seafood, mushrooms, vegetables and chestnuts neatly in the pot before adding the broth into it. Serve hot immediately. 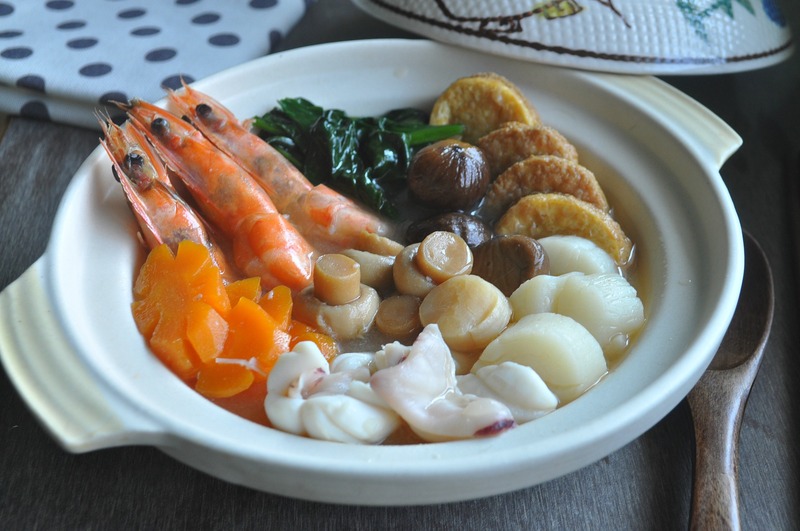 You can add some abalone slices too to spice up the dish further. Add the abalone after the prawns if using. Indulge in the All New Premium & Authentic Straits Kitchen Laksa from Nissin in the Most Convenient Enthrallment ! 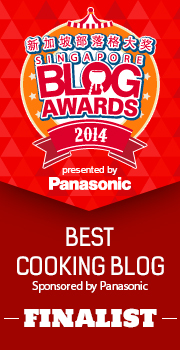 Dear Joyce, I really enjoy your recipes and posts! Unfortunately, just today as I was surfing an online shopping site qoo10, I came across this zichar seller who used your photo as their cover image? I’m not sure if you are informed of it, else it’s a really blatant rip off. The shop is Seafood 805 and the item that they’re using it for is the superior pot (exact same dish too sigh). I’ve tried contacting the customer service but it’s quite slow :( hope this helps though! 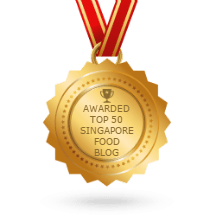 Actually this is not the first time already, previously someone informed me that a malaysian website also used one of the pictures in the blog for their own. I tried to complain also but to no avail. I’ll tried and see if I can lodge a complain to Qoo10 this time.